At Fibre Optic FX Ltd, we stock a full range of LED garage lighting products ranging from super bright and powerful LED garage strip lights which can be wall or ceiling mounted, through to outdoor LED exterior garage lights and security lighting options with sensors. These make life so much easier when returning home at night and parking the car, whilst also helping to keep intruders at bay. Whether you use your garage as a place to park the car or a workshop, or even as an extended living area, finding the right lighting solution can make a huge difference to your quality of life. 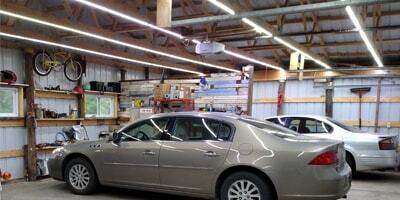 If you use your garage space as a workshop, then you will obviously need a bright and reliable lighting solution that will enable you to see exactly what you are doing. Our LED spotlights are available in both fixed and movable versions and provide an excellent level of illumination at a fraction of the running cost of other lighting products such as CFL lights. Another advantage of using LED lights for the garage workshop is that there is no flickering involved, which can often cause headaches whilst distracting you from the task in hand. Our colour changing LED tape lights are another useful option for the garage, particularly if use your garage as a den, or as a place to relax and chill out in. These programmable home garage LED lighting ideas are highly atmospheric and will help to create a fantastic mood in any contemporary living area. In addition to our LED garage lights for the home, we also offer a range of commercial lighting solutions for parking lots. Our commercial garage lighting products produce a high quality light that makes vehicles, signs and people on foot much easier to see, improving visibility and safety at the same time. For more information, please contact the sales team or click on the individual product images.